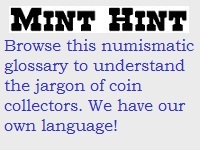 Coin Collecting Jargon Guide: Numismatic Glossary for Hundreds of Terms. Understanding coin collecting jargon is basic to becoming a good hobbyist. Just like any other area of study, numismatics has a language of its own. To a collector, the terms "slab" and "body bag" mean something much different than to a building contractor or mortician, respectively. When you hear the phrase "MS-65 Dimpled Morgan", can you decipher the lingo? Try attending a coin show and listen in on some of the bourse conversations and you'll discover it's almost as if collectors speak in code! The coin collecting jargon guide presented on this page was developed to help you understand the terminology you'll stumble upon frequently as you delve into coin collecting. It is a fairly long, comprehensive numismatic glossary, built over a period of many years. Use the alphabetical links below to move quickly through the hundreds of definitions. Coin collecting involves more than just knowing words in a glossary. There are "Tools of the Trade" designed to bring collectors to a higher fulfillment of their hobby. Click the "Expand Your Numismatic Horizons" button in the upper right hand corner of this page. It opens a new window for collectors serious about advancing to the next level and beyond. Abrasions Light rubbing or scuffing caused by friction. Different than hairlines or bag marks. ACG The abbreviation for ASA-Accugrade, a third party grading service. Adjectival Grading Assigning a coin grade by using adjectives only to describe the coin's condition. Because adjectival grading is somewhat ambiguous, a numerical grading system is employed today to reduce some of the subjectivity inherent in adjectival grading. Examples of adjectival grading terms are Good, Fine, Uncirculated, Choice Uncirculated, etc. See also Numerical Grading and Sheldon Scale. Adjustment Marks Small narrow grooves or file marks found on some early United States coins. Created before striking by filing across the planchet to remove metal for the purpose of reducing the planchet to its proper weight. Aesthetic Appeal See Eye Appeal. AG (About Good) The grade of a coin showing very heavy wear, barely recognizable as to date and type. Album A holder resembling a book with openings for displaying coins. Alloy A mixture of two or more metals. Alteration The deliberate tampering of a coin's feature, such as the date or mint mark, to make it appear to be a more valuable coin. Perpetrators are subject to prosecution. American Eagle Bullion coins of legal tender issued by the US Mint starting in 1986. Both gold and silver coins are struck, in Proof and Uncirculated. American Numismatic Association (ANA) A nonprofit educational organization established in 1891 for the purpose of promoting the study of numismatics. Home base is located in Colorado Springs, CO.
American Numismatic Society (ANS) A nonprofit educational organization established in 1858 for the purpose of promoting the study of numismatics. Home base is located in New York, NY. ANACS A third party grading service. ANA Grading Scale A numeric system of grading coins, developed in the late 1970s, by the American Numismatic Association. Adapted from the Sheldon Scale. See also Numerical Grading and Sheldon Scale. Annealing The heating and slow cooling of a die or planchet. The purpose of annealing is to soften the metal before preparing of the die or striking of the coin. Artificial Toning Unnatural coloration of coin by applying chemicals or other treatments. Done to mimic natural toning. See also Natural Toning and Toning. Assay An analysis performed to determine the characteristics and composition of a metal. Attributes The characteristics factoring into coin grade, such as bag marks, luster, strike quality, and “eye appeal”. AU (About Uncirculated) The grade of a coin having very minimal wear, just one step below Uncirculated. Authentic A genuine coin, not a replica or counterfeit. Most grading services will authenticate coins before determining a grade. Avoirdupois Ounce A unit of weight, requiring 16 ounces to make 1 pound. An avoirdupois ounce is an “ordinary” ounce, in contrast to a troy ounce. Bag Mark Small nicks on the surface of a coin, usually acquired when the coin comes in contact with other coins in a mint bag. Most noticeable on larger coins, such as silver dollars. Also known as contact marks. Bag Stains Darkish toning on coin surface resulting from contact with canvas once used to make coin shipping bags. Sometimes the stain takes on the appearance of fabric mesh. Bank Note Money made of paper. Beading A circle of beads near the rim of a coin, placed there for decorative purposes. An example of a beaded coin is the 1793 Liberty Cap cent. Bicentennial Coinage Quarter, half dollar and dollar coins struck during the bicentennial era of 1975-1976, with special reverses commemorating the 200th birthday of the United States. Bimetallism A monetary standard allowing the unrestricted currency of two metals, usually gold and silver, at a fixed ratio to each other, as coined money. The bimetallic standard also specifies the exact weight of either metal, while observing the fixed ratio, to be coined into a monetary unit (e.g. a dollar). Under the bimetallic standard, anyone could bring either metal to the mint for conversion into coins. Bit A term originating during the Colonial period, meaning 1/8th of a Spanish dollar (12.5 cents). Also know as a Real. Two bits, a slang phrase still popular today, equals 25 cents. Blank The round, blank, flat metallic piece on which a coin is struck Also known as a planchet or flan. Blast Extraordinary luster on a coin. Blazer Means very much the same as "Blast", but a little less extraordinary. Blemishes Small nicks, marks, spots of discoloration, or other imperfections spoiling the surface of a coin. Blue Book A guide to the wholes values of United States coins. Bluesheet The slang term for popular publication, Certified Coin Dealer Newsletter. The weekly newsletter is printed on blue paper. BN (brown) Term applied to a copper coin having less than 5% of the original red color of copper. Most common color of copper coins. Body Bag Slang term, referring to a returned coin from a grading service without a grade, due to a problem with the coin, such as cleaned, artificial toning, etc. The coin is returned in a soft plastic flip (i.e. the body bag), plus the cause for the non-grade. Borderline Uncirculated A coin which shows only the slightest amount of wear. On a 70 point scale, the grade for a borderline uncirculated falls between 55 and 59. Bourse A gathering place where dealers exchange coins and buy and sell coins to the public. Bourse locations are a major aspect of coin shows. Branch Mint Any U.S. mint facility other than the Philadelphia Mint. Broadstrike A coin struck without a firmly seated collar, resulting in material spreading outwards, but still displaying all design details. Brockage An error coin, usually bearing the expected design on one side with an incuse mirror image of the same design on the opposite side. Bronze An alloy of 95% copper, 5% zinc and tin. Brushed A coin that has been rubbed with a brush or cloth, leaving small hairlines or scratches on its surface. BU (Brilliant Uncirculated) The grade of a coin with no indication of wear, usually never exposed to circulation. Correlates to between 60 and 70 on the ANA 70 point grading scale. Same as Mint State (MS). BU Roll Coins set aside in a traditional coin roll quantity that are all Brilliant Uncirculated. For example, a 1954-S Lincoln cent BU Roll contains (50) 1954-S cents, all in uncirculated condition. Buffalo Nickel Nickname given to the Indian Head five cent coin of 1913-1938. Bullion Gold or silver typically produced in form of bars, wafers, or ingots, for the purpose of facilitating trade in precious metals. Bureau of Engraving and Printing An agency of the U.S. Treasury Department mandated to produce currency. Burnishing A rubbing or polishing process whereby the surfaces of a blank or coin are made shiny. Burnishing must always be noted on a coin's description. Buried The mistake of purchasing a coin for more than it can easily be sold for. Business strike An ordinary coin which has been struck for circulation in daily commerce. This is opposed to a proof coin, manufactured through special processes, for sale to collectors and not intended for general circulation. Bust A portrait on a coin, often depicting the head, neck, and sometimes upper shoulders. C The mintmark of the U.S. branch mint at Charlotte, North Carolina, active from 1838-1861. Cabinet Friction Refers to friction or rubbing marks on the highest elements of a coin, as if it was dragged across a wooden cabinet drawer. Wooden storage cabinets were the most popular way to display coin collections up to about the 1930s. Most coins with cabinet friction grade somewhere in the Almost Uncirculated (AU) range. CAC Sticker See Certified Acceptance Corporation. CAM (cameo) Term referring to a proof coin that has frosted lettering and features, providing attractive contrast with the mirrored fields of the coin. Deep Cameo and Ultra Cameo describe Cameo coins having the boldest, most attractive contrast. Carbon spot Brown or black spot on the surface of a coin, caused by oxidation. Cartwheel A phenomenon witnessed on a few coins when placed under a strong light, where the luster revolves like spokes of an imaginary wagon wheel. The term often used in conjunction with silver dollars. CC The mintmark of the U.S. branch mint at Carson City, Nevada, active from 1870-1893. Center Dot A raised dot at a coin's center, caused by a compass used to help the engraver position die devices around the coin in a circular orientation, such as lettering, stars, and dates. Center dots are commonly found on early U.S. coinage. Centering Describing the position of the planchet in relation to the die at the instant of the die strike. A well-centered coin has a rim of equal width over the entire circumference. See also Off-center. Certified Acceptance Corporation A numismatic coin authentication service that verifies if a previously encapsulated coin is considered high end for its grade. Coins meeting the company’s criteria are awarded the green CAC sticker. The Certified Acceptance Corporation is not affiliated with any coin grading service. Certified coin A coin graded and encapsulated in a tamper evident container by an independent coin grading service. Nickname for certified coin is "slab". Certified Coin Dealer Newsletter A weekly publication providing pricing information, trends, and analysis on certified US coins, and is a clear favorite of coin dealers. Available to anyone, not dealers only. Contains wholesale and retail value estimates. The newsletter is credited with facilitating sight-unseen trading of certified coins. Perhaps better known as the "Bluesheet". Is the sister publication of Coin Dealer Newsletter, a.k.a. the "Greysheet". Cherrypick To search for and buy a coin worth more than the selling price. In other words, "looking for a good deal". Choice (1) An adjective used to describe an above average specimen of a given grade. For instance, Choice EF-45 represents a coin above the typical EF-40, but still below AU-50. Choice (2) An Uncirculated or Proof coin generally agreed as the equivalent of grading 63 to 64 on a 70 point scale. Choice (3) Prior to 1987, Choice was equated by the ANA to a coin grading 65 on a 70 point scale. Simultaneously, other coin market activists equated Choice to 63 or 64 on a 70 point scale. In 1987, the ANA dropped the Choice descriptor in their published standards, perhaps to reduce potential confusion. Chop Mark An insignia or an image of some kind punched into a coin by a someone in the public to indicate authenticity. Chop marks are most famously associated with United States Trade dollars circulating in the Orient during the latter part of the 19th century, applied by distrusting Chinese merchants to verify authenticity. Circulated A coin with wear, usually resulting from being released into general circulation. Circulation Strike A coin struck with the intention of being released into circulation for general commerce purposes. This is opposed to Proof coins, which undergo a special manufacturing process and are not destined for general circulation. Rather, they are made specially for collectors. Clad coin A coin that has an outer layer of copper-nickel (sometimes silver) bonded to a center core of a different metal. Has been the primary metallic composition of US dimes, quarters, halves, and dollars since 1965. Clash Marks Accidental striking of the obverse design on the reverse of a coin or reverse design on the obverse of a coin. Caused as a result of top and bottom dies becoming damaged by hitting each other (leaving the opposite side impression on each dies) without a planchet in between, followed later by regular minting using the damaged dies. Cleaned Term associated with a coin having its original surface altered or removed, through the use of chemicals or abrasives, often leaving observable damage or scratches. Such a practice almost always results in a lower coin value. A professional cleaning in water or solvent, to remove dirt, for instance, leaving no mark or residue is usually considered acceptable. Cleaning The act of creating a cleaned coin. Clip A coin or planchet missing a piece of material from its periphery, caused by a malfunction in making the planchet. A curved shape is the most common type of clip. CN (copper nickel) An alloy of copper and nickel used in the production of a few mid-19th century coins. Coffin Coins Graded coins, encapsulated in plastic holders. Coin A flat piece of metal issued by a governmental authority, having a distinctive stamp and a fixed weight and value, for use as legal tender. Coin Dealer Newsletter A weekly publication providing pricing information, trends, and analysis on US coins, and is a clear favorite of coin dealers. Available to anyone, not dealers only. Contains wholesale and retail value estimates. Perhaps better known as the "Greysheet". Is the sister publication of Certified Coin Dealer Newsletter, a.k.a. the "Bluesheet". Coin Doctorer An individual who deliberately attempts to enhance a coin's appearance by cleaning, repairing, or any other form of alteration. Coin Show An open meeting of coin dealers, convened for the purpose of buying, selling, and trading between the dealers and with the public. Collar An apparatus used during the minting process to restrict the outward flow of metal at the moment of striking. A collar also stamps edge designs, if any. Colonial Coins Coins issued by any one of the 13 original colonies. The colonies ceased coinage production following the ratification of the Constitution. A few private manufacturers also minted coins that circulated in the colonies. Color Alludes to the hues or color characteristics of a coin. For example, copper coins can have a red or reddish brown color, and silver coins, a rainbow-like luminous or gleaming color. Commemorative A special coin or medal produced to honor an outstanding person, place, or historical event. Commercial grade The highest feasible grade that could be applied to a particular coin, as a result of applying grading standards less stringently. Condition The physical state of a coin. Is a primary consideration in determining coin grade. Condition Census A list of the finest known specimens of a particular variety of coin. Consignment Coins turned over to an auction company or dealer to sell. Contact Marks Marks on a coin resulting from contact with other coins or some other object. Copper An elemental metal used in the production of certain coins, including half cents and large cents, primarily before the mid-1860s. After that, copper was replaced by bronze (see Bronze). Also, copper is added in small amounts to gold and silver coins to increase hardness and strength. Copper-Nickel An metal consisting of mostly copper, alloyed with a substantial percentage of nickel. First used to produce the Flying Eagle cent of 1856. Copy A replica of an original coin issue. Copies are usually made of a different metallic composition than the original. According to the Hobby Protection Act of 1973, all numismatic copies in the United States must be clearly marked with the word "COPY". Also known as a Replica. Coronet A type of Liberty Head depicted on copper and gold coins throughout much of the 19th century. Miss Liberty has a coronet, generally characterized by LIBERTY. Corrosion Damage resulting from reactive chemicals, often airborne, upon metals. Counterfeit A fake monetary unit resembling genuine currency. A highly illegal practice. Counterstamp A design of some sort stamped on a coin for a particular identification or promotional purpose. Counterstamped coins are graded following regular guidelines, but a description and condition of the counterstamp must also be provided. Crackout An coin encapsulated by a third party grading service that is thought by the owner to be undergraded. The coin is "cracked out" of the plastic holder and submitted again as a raw coin, in the hope of receiving a higher grade. Cud A raised lump on a coin caused by striking with a die having a portion of its surface cracked or broken off. Cull Refers to a coin picked out from a group of coins because it is of extraordinarily poor quality, barely recognizable, sometimes even with damage (has holes or is bent, for example). Curated Coin Refers to a coin that has been professionally cleaned to improve the coin's appearance, while at the same time imparting no harm upon the coin. Most buyers accept curated coins without expecting a discount. Removal of sea life encrustation from a coin recovered from a shipwreck, with no evidence of the cleaning process, is an example of a curated coin. Currency Any form of money used as a means of trade. Includes coins and paper money. D The mintmark of the U.S. branch mints at Dahlonega, Georgia, active from 1838-1861, and of Denver, Colorado, active from 1906 to present. Date The year indicated on a coin, almost always the year it was minted. DCAM (deep cameo) An expression to describe a proof coin having heavily frosted design elements and lettering that contrast with the fields. See also Cameo (CAM). Dealer A person or company that buys and sells numismatic materials for profit. Delamination Occurs when metal missing is peeling from the surface (or already gone) because of poor bonding or planchet imperfections. Denomination The face value assigned to a coin, such as cent, nickel, dime, quarter, half dollar, and dollar. Dentils The toothlike devices encircling the rim of some coins. Also known as denticles. Design The basic theme of a coin. Designer The person credited with creating the design of a coin. Design Type The name assigned to the design on a particular coin. Detail Grade Same as Technical Grade. Details Minute characteristics in a coin design. Primary examples include small details in wreaths, hair, leaves, and feathers. Device The principal design element on a coin, such as a portrait, eagle, or shield. Applies to obverse and reverse sides. Die An engraved cylindrical stamp made of hardened metal, with an incuse mirror image design for impressing on a planchet to produce a coin. Dies are used in pairs, one having the obverse design and the other, the reverse design. A planchet is placed between the die and struck simultaneously by the die pair to produce a coin. Die Break A die that has cracked during use and effects the strike of a coin, producing a cud. Die Chip A small fragment broken off from a die. Metal flows into the resulting hole during striking, resulting in a cud. Die Clash See Clash Marks. Die Polish Small raised lines in the field of a coin caused from polishing of a die by Mint employees to remove chips, clash marks, etc. Die State The condition of a die at any given point in its life. Dies having less wear produce coins having sharper details. Dipped Refers to removing tarnish, surface dirt or changing the coloration of a coin by placing in a mild acid wash solution. DMPL (Deep Mirror Prooflike) A term applied to a coin with deeply reflective fields, with a mirror-like appearance. Used frequently in describing certain Morgan silver dollars. Pronounced as "Dimple". Double Denomination An error coin where a previously struck coin is struck again by the dies of another denomination. Double Eagle A United States gold coin of $20.00 face value. Double struck A coin that was struck twice. Doubled die A die struck more than once by a hub in misaligned positions during the creation of the die, resulting in the doubling of the coin’s design elements. Eagle A United States gold coin of $10.00 face value. Name also applies to modern day bullion coins. Edge The circumference of a coin that may be plain, reeded or decorated in some way. EF (Extremely or Extra Fine) The grade of a coin that is lightly worn with sharp and well defined features. Also recognized as XF. Electrotype A copy of a coin created by an electroplating process. Sometimes used to produce counterfeit. Element A design, lettering, or marking on a coin. Engraver The person artist who cuts a coin design into a die. Environmental damage Damage to a coin resulting from exposure to environmental conditions. E. Pluribus Unum A Latin phrase meaning "Out of many, one". This is the motto on numerous U.S. coins. Error coin A coin minted with a defect of some kind (wrong metal, off-centered, etc.) that escaped quality control and mistakenly released to the public. Also known as a Mint Error. Exergue The lower portion of a coin, separating from the rest of the coin by a line, frequently bearing the date, mintmark, and designer's initials. Eye Appeal Subjective overall attractiveness of a coin, based on such things as toning, color, centeredness, etc. Eye appeal plays a factor in determining a coin's grade. F (Fine) The grade of a coin having moderate to considerable even wear throughout. Face Value The monetary amount a coin is worth as spending money. Has no relation to collectible value. Fair A term used in grading to indicate that a coin is badly worn, almost to the point where it is barely identifiable. Fasces The vertical device on the reverse of Mercury dimes. Is a Roman emblem of authority, having a bundle of rods held together by horizontal bands. FBL (Full Bell Lines) A term used for a Franklin half dollar where the lower set of lines on the Liberty Bell is fully visible. Full Bell Lines are rarer than non-Full Bell Lines, and is an important modifier in grading Franklin half dollars. Federal Reserve Bank Known informally as "the Fed", the Federal Reserve Bank is the central bank of the United States. It was created in 1913 and consists of a network of twelve Federal Reserve Banks and a number of branches monitored by a of the Board of Governors. -- conduct the nation’s monetary policy by influencing the monetary and credit conditions in the economy in pursuit of maximum employment, stable prices, and moderate long-term interest rates. -- regulate banks to ensure the soundness of the nation’s banking and financial system and to protect credit consumers. -- maintain the stability of the financial system and contain risks that may arise in financial markets. -- provide financial services to depository institutions, the U.S. government, and foreign official institutions, including playing a major role in operating the nation’s payments system and dispersing coin and paper money to financial institutions throughout the country. FH (Full Head) A term used for a Standing Liberty quarter where Liberty’s helmet displays full detail. Full Head detail is rarer than regular head detail, and is an important modifier in grading Standing Liberty quarters. Fiat Money Money that is not backed by precious metals and is legal tender by governmental decree. A Federal Reserve Note is an example of fiat money. Field The open area, (i.e. the background) on a coin's surface not occupied by a design or lettering. Fillet Head The rendition of Miss Liberty where her hair is tied with a band, usually on the forehead. Liberty head nickels of 1883-1913 are an example. Fine weight The actual weight of a precious metal in a coin, or any bullion form, such as a bar or ingot. The fine weight is always less than the total weight of the object, if alloying metals are also used. For example, a US Double Eagle (.900 fineness) has a gold fine weight of .9677 ounces, though the total weight of the coin exceeds 1.0000 ounces (the word ounce, when applied to precious metals, refers to a troy ounce, equaling about 1.1 ordinary ounces). Fineness The portion of a precious metal compared to overall weight of the coin or bullion object, normally expressed in terms relative to one thousand parts. Thus, if a US gold coin is .900 fine, this means that 90% of the coin is gold and the remainder is alloy. Finest Known The coin judges to be the finest specimen known of a denomination, type, date, or variety. First Strike A coin struck shortly after a new die is placed into service. First strike coins often are the most coveted by collectors, having sharper details and even sometimes proof-like qualities. Fish A buyer or seller who is unaware of the true market value of a coin and buys or sells it at a price not on par with its true value. Flan The round, blank, flat metallic piece on which a coin is struck. Also known as a planchet or blank. The term is used primarily in European nations. Flat Strike Occurs when the front and reverse dies do not fully advance towards each other as a coin is being struck, causing the highest areas of relief on the coin's surface to be poorly defined, because the metal is not forced into the deepest recesses of the dies. Very common with Buffalo nickels, Standing Liberty quarters, and Walking Liberty half dollars from the 1920s. Flip A transparent bi-fold plastic coin holder, preferably made of a non-reactive material, to minimize possibility of damaging the stored coin. Flip a Coin Selling a coin quickly after purchasing it, in the desire to earn a quick profit. Flow Lines Microscopic striations visible in a coin’s surface created by the movement of metal caused by high pressure die striking. Flyspecks Very small spots of oxidation sometimes found on coin surfaces, resembling flyspecks. Caused by exposure to minute moisture particles. Top grade nickel and copper coins most susceptible. Fractional Currency Paper money with a face value of less than one dollar. Fresh Material Coins that have not been on the market for a very long time. Frost An intentional crystallized-metal effect seen in the recessed areas of a die. Frosted devices Raised devices on coins struck with frosted dies, resulting in a frosty appearance. FS (Full Steps) A term used for a Jefferson nickel where 5 ½ or 6 steps leading up to Monticello on the coin’s reverse are fully defined. Full Steps are rarer than “blended” steps are an important modifier in grading Jefferson nickels. FSB (Full Split Bands) A term used for a Mercury dime where the horizontal bands of the fasces device on the reverse side are fully separated. Full Split Bands are rarer than normal bands, and is an important modifier in grading Mercury dimes. Fugio Cent The first coin authorized by the United States, produced by private contractors in 1787. Full Strike A coin displaying complete design details, caused by a hard strike by a non-worn die. FSBs, FHs, are examples of full strike results. G (Good) The grade of a coin that is heavily worn with the design visible but weak in places. In the 70 point ANA numerical system, rates about G-4. Galvano A reproduction created by electroplating with metal over an artist's original plaster coin design. The galvano is then set up in a reducing lathe to machine a die or hub. Gem (1) A nonspecific expression used for a coin of exceptional Uncirculated or Proof quality, having few defects. Gem (2) An Uncirculated or Proof coin generally agreed as the equivalent of grading 65 to 66 on a 70 point scale. Gem (3) Prior to 1987, Gem was equated by the ANA to a coin grading 67 on a 70 point scale. Simultaneously, other coin market activists equated Choice to 65 or 66 on a 70 point scale. In 1987, the ANA dropped the Gem descriptor in their published standards, perhaps to reduce potential confusion. Godzilla An extremely attractive coin. Gold A yellowish metallic element often used in high-denomination coins. In coinage, nine parts of gold are typically alloyed with one part copper for added hardness and strength. Gold Bugs Advocates of a post-Civil War political movement seeking a monetary policy based on a national gold standard. Opposed by the Silverites. Gold Eagle A gold bullion based coin issued by the U.S. mint starting in 1986. Issued in various sizes ranging from .10 ounce to 1.00 ounce of gold, with corresponding face values of $5 to $50. Not intended for circulation. Gold Standard A standard which defines a monetary unit (e.g. a dollar) as consisting of a certain weight of gold. The legal gold price is set to the value of gold coined into money. (example: a $10 gold eagle, containing .48375 troy oz. of pure gold, set the price of gold at $20.67 per troy oz.). Anyone could bring (i.e. "sell") gold bullion to the mint and in exchange receive an amount (e.g. in dollars) of coinage corresponding to the legal price. Grade A rating indicating the condition or amount of wear that a coin has received. Today, coins are graded on the 70 point numerical scale popularized by the American Numismatic Association. Grading Services Independent organizations that, for a fee, will review a coin, assign a grade, and encapsulate coin in tamper evident container. Grain The smallest unit of weight in the troy system, equivalent to to 1/480 of an ounce and in the avoirdupois system, equivalent to 1/437.5 of an ounce. As a unit of measurement, the grain was frequently used in the 19th century. Gram The primary unit of weight in the metric system. 31.1033 grams = 1 troy ounce. 1 avoirdupois (i.e. ordinary) ounce = 28.3500 grams. Granular Describes a coin surface having very small irregularities or a porous appearance, caused by oxidation either before (in the planchet stage) or after striking. Granularity is most often seen in early copper coins. Gresham's Law The tendency for a coin of lower intrinsic value to circulate more freely than a coin having the same face value, but of higher intrinsic value. The coin of higher intrinsic value is likely to be hoarded. This observation is credited to 16th century English financier Sir Thomas Gresham. Greysheet The slang term for popular publication, Coin Dealer Newsletter. The weekly newsletter is printed on grey paper. Hairline A thin line or scratch, generally observable in the field of a coin. Often caused by cleaning or polishing. Highly undesirable. Half Cent A coin produced in the United States from 1793-1857, having a face value of 1/200th dollar. Half Dime Silver coin of five cent face value issued by the US from 1794-1873. Half Eagle A United States gold coin of $ 5.00 face value. Hallmark Markings placed on a bullion product to indicate fineness or other characteristics. Hammer Price The price at which a bidder wins an auction lot. When the hammer comes down, the auction ends. Haze A hazy film detectable on the surface of a coin. High Points Areas of highest relief on a coin’s surface. The high points are the most difficult areas to obtain a sharp strike, but the first to wear or receive abrasions. High Relief Refers to a high pointed design feature on a coin's surface that is intentionally raised to an exceptional level. Producing a high relief coin requires multiple strikes, to fully push the metal into the deepest recesses of the die. The best known High Relief coin is the MCMVII St-Gaudens $20 double eagle, made in 1907. Hobo Nickel A Buffalo nickel (though sometimes other coins are used) physically modified into a radically different design. Holder A contrivance for storing a coin. Holed A coin having a hole drilled or pierced, for the purpose of dangling on a necklace, or some other reason. Holes can be carefully filled to avoid obvious detection (see Plug). Any holed coin, whether plugged or not, must be described as such. Hub A steel object used to manufacture a coin die. The coinage devices appear in relief (i.e. are raised). By contrast, the same devices in the resulting die are incuse (recessed). ICG The abbreviation for Independent Coin Grading Service, a third party grading service. Impaired Proof A proof coin downgraded because of damage or signs of circulation wear. On the 70 point scale, an impaired proof should always rate less than 60. Incuse The part of a coin’s design pressed below the coin's surface. Ingot Metal (including precious metal) shaped into a convenient form for transportation and storage. Inscription The legend or lettering stamped on a coin or medal. Intrinsic value The cash value of the precious metal within a coin. Determined by fineness, resulting troy weight, and current bullion market prices. Iridescence Refers to the multi-colored, rainbow-like toning on a coins surface, especially of a silver coin. See also Color and Toning. Juice Slang term for the commission paid on a coin. The usual Juice on a coin purchased at an auction is 10 to 15% over hammer price. Junk UNC A mint state coin, valued only at bullion value. An example of a Junk UNC is an MS-60 1964-D Roosevelt Dime. Key Date A coin of relative scarcity needed to complete a coin collection. There is limited supply to meet demand, driving prices higher over time, compared to its more common counterparts. Lamination Flaking or peeling away of material from a coin's surface, usually caused by unsatisfactory metal bonding when the planchet was manufactured. Large Cent US one cent coins minted from 1793-1857, having a diameter about 40% larger than the more familiar small cent. Legal Tender Currency issued by a governmental authority and sanctioned as money. Can be coins or paper money. Legend The primary inscription on a numismatic item. Lettered Edge The narrow edge of a coin having an inscription. Light Strike See Weak Strike. Lint Marks Miniature incuse impressions on the surface of a Proof or Uncirculated coin. Lint Marks are caused by foreign objects such as hairs, threads, etc. sticking to the die. Lock 3 A coin that would easily earn an MS-63 grade from a third party grading service. Loupe A magnifying glass for studying coins. Lot An item, or group of items, usually assigned an identification number, for sale at an auction. Luster The glossy sheen reflected from the surface of a coin, resulting from the flow of metal caused by the striking of the dies. At the time of minting, the luster is at its strongest, but may fade over time, become discolored, or spotted. Also called Mint Luster. Made Coin The most recent grade on an encapsulated coin that had been cracked out and submitted to a grading service more than once. Market Grade The numerical grade at which a coin is bought and sold in the open marketplace. The Market Grade takes into consideration other factors such as eye appeal or pitting that can influence a coin's overall appearance positively or negatively (as opposed to Detail Grade). Most of the major grading services assess Market Grade. Market Price Same as Market Value. Market Value The price a coin is capable of selling for if put up for sale. Also known as Market Price. Matte Proof A special type of proof manufacturing process used on some United States coins from 1908-1916. Popularized by the Paris Mint in the 1890s, the surface of Matte Proof coins had a granular or satiny look, caused by sandblasting or acid-pickling of the dies. Matte Proofs were discontinued because they failed to gain popularity from collectors. Variations of the Matte Proof process, used during the same time period, include Roman Finish Proofs, Sandblast Proofs, and Satin Proofs. Medallion A precious metal round wafer, mimicking a coin. Not to be confused with legal tender. Often used to recognize an event, place, person, or group of people. Medium of Exchange Any item that is agreed upon be be placed at a certain value. Melt Value The value of precious metal in a coin, calculated by multiplying the weight of the metal within the coin by the market price of the metal. Micro A term applied to something very small or even on the microscopic level. Milled Edge A raised line around the circumference of a coin. Mint A facility where coins are minted under governmental authority. Mintage The total quantity of coins minted at a given mint in a given time period, usually one year. Mint Bloom The luster of a freshly minted coin. Mint Error A coin minted with a defect of some kind (wrong metal, off-centered, etc.) that escaped quality control and mistakenly released to the public. Also known as an Error Coin. Mint Luster The glossy sheen reflected from the surface of a coin, resulting from the flow of metal caused by the striking dies. At the time of minting, the luster is at its strongest, but may fade over time, become discolored, or spotted. Also known simply as Luster. Mintmark A symbol, usually a small letter, found on a coin to indicate which Mint facility produced the coin. Mint Set A full complement of regular business strike coins of every denomination struck in a given year by a mint and assembled in a set by mint employees, typified by specialized packaging. Modification A slight variation in the design of a coin. Mottled A coin with spots or streaks of uneven shades or colors. Motto A word or phrase on a coin expressing an important ideal. The most common example is “In God We Trust”. MS (Mint State) The grade of a coin with no indication of wear, usually never exposed to circulation. Correlates to between 60 and 70 on the ANA 70 point grading scale. Same as BU (Brilliant Uncirculated). Mule A coin struck from a pair of dies not meant to be used together. The result is a coin with mismatched sides. Natural Toning Surface coloration resulting from normal exposure to environmental conditions, occurring over a period of many years. See also Artificial Toning and Toning. Net Grade The comprehensive grade assigned to a coin after its Detail Grade is evaluated against appearance detractions or enhancements, such as pitting or eye appeal, respectively, resulting in a "net grade" more indicative of true market value. Most of the major grading services assess Market Grade. Same as Market Grade. Net Price A term used to indicate that the seller is not willing to negotiate on the posted price. NCG The abbreviation for Numismatic Guaranty Corporation of America, a third party grading service. Nick A small scratch on a coin caused by contact with another coin or some object. Nickel Typically refers to a coining alloy comprised of 75% copper and 25% nickel, though it appears as a whitish color. First used on the three-cent coins minted 1865-1889, the same nickel alloy has been used almost continuously on 5 cent coins since 1866 (hence the nickname "Nickel" for our 5 cent coin). NTC The abbreviation for Numistrust Corporation, a third party grading service. Numerical Grading The use of numbers on a continuous scale, for the purpose of assigning a numerical grade to a coin's condition. The underlying thought of a numerical grade is to achieve a clearer understanding of a coin's condition relative to other coins, and eliminate the more ambiguous Adjectival Grading. The concept of numerical grading was first introduced by William Sheldon in the late 1940s, and later modified by the American Numismatic Association, and others, since then. The ANA 70 point scale is widely used today. Examples of numerical grading terms are Good-4, Fine-12, etc. See also Adjectival Grading and Sheldon Scale. Numismatics The study and collection of money and medals, including coins, tokens, paper currency and medals. Numismatist A student of numismatics. O The mintmark of the U.S. branch mint at New Orleans, Louisiana, active from 1838-1861, and again from 1879-1909. Obsolete A coin design or type that is no longer being minted. Obverse The front or “heads” side of a numismatic item, generally the side bearing the date and the principal device. Off-center A coin that was not centered when struck by a die, causing a portion of the coin’s design to be missing. Original A coin officially struck using genuine dies, in the year indicated by the date on the coin. See also Restrike. Original roll Stacked coins of the same denomination, in a pre-determined quantity, wrapped in paper and stored, minutes after being minted. Overdate An impression made by superimposing another date (i.e. year) digit over a date digit of a die used in an earlier year. The result is a coin bearing the “new” date, but under close examination, the “old” date is faintly visible. Overgrading Awarding a coin a better grade than it deserves. This practice is sometimes used unethically to sell coins for more than their true worth. Overmint-mark An impression made by superimposing a mintmark over a different mintmark. This is usually done to make a coinage die already prepared for one mint usable at another. Portions of the “old” mintmark are faintly visible. Overstrike A coin made over a previously struck coin, using a different pair of dies. Oxidation The chemical reaction on the surface of a coin, caused by exposure to air, dampness, industrial fumes, or other elements capable of reacting with oxygen. The resultant oxide compounds can create a tarnished, or otherwise undesirable, appearance. P The mintmark of the U.S. mint at Philadelphia, Pennsylvania, active from 1793 to present. The "P" mintmark first appeared on a coin in 1942, and has been in continual use since 1980. Patina A thin layer of corrosion, usually green or brown, appearing on the surface of copper or bronze. Caused by oxidation over a long time period, and is found frequently on ancient coins. Pattern An experimental coin, generally of a new design, denomination or metal, used as a test strike. PCGS The abbreviation for Professional Coin Grading Service, a third party grading service. PCI The abbreviation for PCI Inc. Coin Grading Service, a third party grading service. Perfect An Uncirculated or Proof coin generally agreed as the equivalent of grading MS-70 on a 70 point scale. Extremely rare. Pick Up Point An area where a feature, such as die doubling, is the most visible. Piece of Eight A Spanish coin with a face value of eight Reales (see also "bit"), widely circulated in the American colonies. The U.S. dollar was was based on eight Reales. Pioneer Gold Privately produced gold coins, struck to address coin shortages in frontier regions of the United States. PL (Prooflike) The abbreviation used for a regular circulation coins (i.e. non-Proof strikes) possessing a reflective, Prooflike surface. Most often invoked when describing Morgan silver dollars with superb mirror-like surface qualities, resembling those of a Proof coin. Planchet The round, blank, flat metallic piece on which a coin is struck Also known as a blank or flan. Platinum Eagle A platinum bullion based coin issued by the U.S. mint starting in 1997. Issued in various sizes ranging from .10 ounce to 1.00 ounce of platinum, with corresponding face values of $10 to $100. Not intended for circulation. Playing the Game Resubmitting a coin to one or more grading services more than once, in the hope it will be receive a higher grade. For some coins, a single point increase means thousands of dollars in trading value. Of course, Playing the Game is somewhat risky, as the coin can possibly receive a lower grade than before. Plug A process by which a hole in a coin is filled, in an attempt to restore the coin to its original appearance. The grading description on any coin having a plugged hole must indicate the coin has been plugged. Polish The action of imparting a mirror-like finish to the surface of a struck coin, accomplished by a buffing wheel, silver polish, or any abrasive material. The grading description of any coin having a polished surface must indicate the coin has been polished. Population Report Periodic publication produced by grading services, indicating the quantity of coins that have been awarded a certain grade for each date an mintmark submitted. The value of Population Reports is that they provide some insight to the true scarcity of certain coins in certain grades, in spite of the skewing factor caused by crackouts. Poor See About Good (AG). Porous Possessing a granular surface, resulting from oxidation, most frequently associated with older copper coins. Portrait A head, bust, or other likeness of a person included in a coin design. PQ (Premium Quality) A generic term used to describe coins that are the finest specimens within a certain grade, due to good eye appeal or other beneficial qualities. PR (proof) The abbreviation for a coin produced for collectors from a specialized manufacturing process, not intended for general circulation. Involves polished planchets and dies, often double struck to accentuate the coin’s devices. Prestige Set A set of coins produced by the U.S. Mint, containing one or more proof commemorative coins released in the same year, as well as a proof cent, nickel, dime, quarter and half dollar. Is not the same as a Proof set. Price Guide A publication listing wholesale and/or retail values of a wide spectrum of coins. Pristine A generic term applied to coins in original, unspoiled, “leaving the mint” condition. Problem coin A coin that has been cleaned or damaged or has other unfavorable characteristics. A problem coin is usually valued at a small fraction of other examples of the same coin having no problems. Processing A term describing the treatment of a coin, in an attempt to improve appearance and grade. Processing encompasses wire brushing, acid dipping, or any other surface tampering. It is considered unethical to try to sell a processed coin without describing it as such. Proof A coin produced for collectors from a specialized manufacturing process, not intended for general circulation. Involves polished planchets and dies, often double struck to accentuate the coin’s devices. Common abbreviation is PR, sometimes PRF. Prooflike A term used to describe regular circulation coins (i.e. non-Proof strikes) possessing a reflective, Prooflike surface. Most often invoked when describing Morgan silver dollars with superb mirror-like surface qualities, resembling those of a Proof coin. Commonly abbreviated as PL. See also DMPL. Proof Set A full complement of Proof coins of every denomination struck by a mint in a given year and assembled in a set by mint employees, typified by specialized packaging. PVC A chemical (polyvinyl chloride) used in come coin flips to keep the plastic soft and pliable. PVC can break down and leave slimy film on the coin. PVC flips were largely discontinued in the early 1980s, when its chemical reactivity was first realized. Quarter Eagle A United States gold coin of $ 2.50 face value. Rare Refers to a coin available in very limited quantities, relative to demand. Raw A coin that has not been graded and encapsulated by a grading service. RB (Red Brown) Term applied to a copper coin retaining 5% to 95% of the original red color of copper. RD (Red) Term applied to a copper coin retaining 95% or more of the original red color of copper. Real A Spanish monetary also used throughout the American colonies. Plural = "Reales". See also "Bit" and "Piece of Eight". Reeded Edge The edge of a coin with grooved lines running vertically around its circumference. All current production coins, with the exception of cents and nickels, have reeded edges. Reflective Describes a coin's surface having highly reflective, mirror-like properties. Registry Set Images of individually owned coin sets published online by several numismatic grading services. The sets are assessed by the grading services by their completeness and numerical grade. Registry sets make it easier and safer for collectors to share their coins with fellow numismatists. Relief The part of a coin design that is raised above the coin's surface. Relief is the opposite of incuse. Repair The action of repairing a coin that has a hole, damage, or defect of any kind. Commonly employed repair methods include plugging and polishing. The grading description of any repaired coin must indicate that the coin has been repaired. Replica A copy or reproduction of a coin, though not the same as counterfeit. According to the Hobby Protection Act of 1973, the word "COPY" must be plainly visible on any replica. A Replica is sometimes called a Copy. Repunched Date A date with at least one digit punched into the die more than once, in order to strengthen its appearance. This often results in a slight doubling effect of the digit(s) when a coin is struck from a such a die. Repunched dates, letters, and other features are common in 19th century coins. Also known as Recut. Restrike A coin struck from the original dies in a year beyond the year of original issue. Reverse The back or “tails” side of a numismatic item, generally the side opposite the side bearing the date and the principal device. Riddler A machine that filters out planchets of the incorrect size or shape. Rim The raised area running along the perimeter on both sides of a coin, thus encircling the obverse and reverse. The rim’s purpose is to protect the devices of the coin from wear. Rip Purchasing a coin at a very attractive price. Roadrunner A dealer who does business at coin shows, but does not have a table set up. Roadrunners are sometimes called Road Warriors. Roll Stacked coins of the same denomination, in a pre-determined quantity. Examples: 50 cents to a roll, 40 nickels to a roll, etc. Rolls are often wrapped in paper, but many times are stored in plastic tubes or other material. Not necessarily the same as an Original Roll. Rubbing Occurs when a coin is slid across a hardened surface, causing the removal of original mint luster, while leaving evidence of friction. See also Cabinet Friction. Rusted Die Rusted dies can result while in storage, leaving some pitted areas on the die. Coins struck from rusted dies can have raised spots, caused by metal flowing into the rust-eaten pits during the striking process. The effects from rusted dies are not factored into a coin's grade. S The mintmark of the U.S. branch mint at San Francisco, California, active from 1854-1955, and again from 1968 to present. Scarce Refers to a coin existing in small quantities, relative to demand. Scratch A deep line or gouge in a coin caused by coming in contact with a jagged object of some kind. Seigniorage Revenue or a profit taken by the government from the minting of coins, usually the difference between the cost of coin production (metal, labor, etc.) and the face value of the coin. The profit is realized when the government "sells" the coins at face value to the Federal Reserve Banks (FRBs). For example, if it costs the Mint 10 cents to make a quarter, and when the quarter enters circulation via the FRBs, the government earns 15 cents. Select An Uncirculated or Proof coin generally agreed as the equivalent of grading MS-62 on a 70 point scale. Semi-Prooflike A term used to describe a coin having some proof-like qualities. See also Proof-like. Series Coinage containing all dates and mint marks of a specific design and denomination. Example: Mercury dimes, 1916-1945. Sheet At The price of a coin on the Grey Sheet or Blue Sheet. Used in language as "what does a coin sheet at?" Sheldon Scale The 70 point numeric grading developed by Dr. William Sheldon in 1948 for Large Cents. The Sheldon Scale eventually became the model for grading all coins. See also Numerical Grading. Shot Coin A coin that stands a good chance, in the opinion of the owner, to earn a higher grade from a grading service, if cracked out and resubmitted. Silver A whitish metallic element often used in United States general circulation coinage from 1794-1964. In coinage, nine parts of silver are typically alloyed with one part copper for added hardness and strength. Silver Certificate Paper money once redeemable for its face value in silver. The last opportunity to redeem silver certificates was in the mid-1960's. Silver Eagle A silver bullion based coin issued by the U.S. mint starting in 1986. Containing one ounce of silver, it had a face value of $1, though it was not intended for circulation. Silver Standard A standard which defines a monetary unit (e.g. a dollar) as consisting of a certain weight of silver. Silverites Advocates of a post-Civil War political movement favoring a monetary policy based on a national bimetallic (i.e. gold and silver) standard. Opposed by the Gold Bugs. See Bimetallism. Slab Slang term for the permanent protective coin encapsulation provided by grading service companies. Information mounted on the slab includes the date, mint mark, grade of the coin, and identity of grading service company. Slab City Any one of the third party grading service. Sleeper A coin temporarily priced below its true market value, positioned to someday rise significantly in price to properly realign (or establish) itself in relation to its scarcity, relative to demand. Slider Used to describe an AU (About Uncirculated) coin closely resembling an Uncirculated coin. SMS (Special Mint Set) A set of coins, produced and packaged by the US Mint from 1965-1967, classified neither as business strikes or proof. The intent was to use Special Mint Sets to eliminate proof sets. Specie Coined money, generally gold and silver. Split Grade Different grades for the obverse and reverse sides of the same coin. Spot Price The current market price for immediate sale of a precious metal, or any other commodity. Spread The difference between a seller's buy and sell prices for a coin. Star Rating An indication of Premium Quality (PQ), applied by the NGC coin grading service. Striations Slight raised lines on the surface of a coin, caused by over polishing the die. Strike The process of stamping a coin planchet with a design. A strong strike is a coin with all the details struck very distinctly. Conversely, a weak strike has details impressed lightly and less distinctly. Striking Refers to the process by which a coin is minted, whereby a coin planchet is placed between two dies and hit, leaving impressions on both sides of the coin, the obverse and the reverse. Superb An Uncirculated or Proof coin generally agreed as the equivalent of grading 67 to 69 on a 70 point scale. Surface Loosely speaking, the entire area of the coin. Sweating An illegal method employed by some in the past to obtain precious metal, usually gold, from coinage. The coin is treated by acid to "eat away" some of the metal on the coin's surface, and later recovered from the solution. The procedure leaves the coin with a grainy or slightly rough appearance. Technical Grade The grade given to a coin, either Adjectival (example: Good) or Numerical (Example: G-4), based strictly on the amount of wear. The Technical Grade does not take into consideration other aspects of a coin that can impact its market value, such as sharpness of strike, eye appeal, corrosion, etc. For instance, a coin having a Technical Grade of MS-65 can have a Market Grade of MS-63 because of an aesthetic distraction. Technical Grade is the same as Detail Grade. Thumbing The deceptive practice of attempting to hide an abrasion on a coin, by using the thumb to obtain a bit of skin oil from the corner of nose, and carefully rubbing it onto the affected area on the coin. The oil can possibly reduce the shiny appearance caused by the imperfection and conceal its existence. Token A coin-like object used to obtain a specific product or service. It has no stated monetary value. Toning Natural coloration of a coin caused by the atmosphere over a long period of time. Some collectors prefer attractively toned coins, and will pay premiums to acquire them. Tooling Using metal alteration tools to touch up the appearance of a worn coin, to make it seem as if original detail had not been lost through circulation. Long ago, Tooling was more acceptable than it is today. Any coin that has been Tooled must be described as such. Trade Dollar A U.S. coin with a face value of $1 minted 1873-1885 specifically for commerce in China. Containing nearly 2% more silver than regular silver dollars, trade dollars were introduced to compete against silver-heavy coins of other nations also circulating in the Orient. Trade dollars were not legal currency within US borders. See also "Chop Marks". Trap Coin A coin that is priced at top dollar for a grade, but does not deserve that grade. The buyer will probably have difficulty selling the coin for the same grade, and is "trapped". Trime A U.S. silver coin with a face value of 3 cents minted from 1851-1873. Troy Ounce A unit of weight, equal to about 1.1 avoirdupois (ordinary) ounces. The word ounce, when applied to precious metals, refers to a troy ounce. Truncation The cut off bottom portion of a bust. Tube A plastic cylindrical container designed for storing a stack of coins of the same denomination. Type A coin's main distinguishing design. Type Coin A representative coin from a given series. Type coins are collected based on the series they exemplify instead of its date and mintmark. Type set A collection of all coins representing a given denomination. Typical A term once used in the ANA grading standards to describe a low-level Uncirculated or Proof coin, equivalent to a 60 on a 70 point scale. The Typical descriptor was discontinued in 1987. Uncirculated A coin preserved in a condition as issued by the mint, without any signs of wear. Also called Brilliant Uncirculated (BU) or Mint State (MS), scoring between 60 and 70 on the ANA grading scale. Undergrading Awarding a coin a lesser grade than it deserves. This practice is sometimes used unethically to purchase coins for less than their true worth. Unique A coin of which only a single specimen is known to exist. Example: the 1849 Double Eagle has a mintage of 1. Upsetting mill A machine that raises the perimeter on both sides of a planchet to form a rim. VAM Any variety of U.S. silver dollar described by Van Allen and Mallis in their book Morgan and Peace Dollars. Variety A relatively small change from the basic type design of a coin, often resulting from differences between individual dies of the same basic design. Verdigris Dirt, or other foreign substance sticking in the recesses of a coin's surface. Can be cleaned, if done professionally, without hurting the value of the coin. Vest Pocket Dealer A small volume dealer who doesn't set up at shows nor has a coin shop. VF (Very Fine) The grade of a coin having light to moderate wear on the highest points, with clearly defined details. VG (Very Good) The grade of a coin with significant wear, but with clear main details. Wafer A disk shaped object, often comprised of precious metal. Water Mark A design put into paper during the manufacturing process by pressing it while wet between rollers bearing the design. Weak Strike A coin with some of its high relief details not sharply formed due to alloy hardness, inadequate striking pressure or improper die spacing. Wear The slow removal of metal from the surface of a coin caused by everyday handling and circulation. Whizzing The process of altering of a coin's appearance by using a rotating wire brush to move or remove metal from the surface. The goal of whizzing is to give a coin the artificial appearance of being better grade than it actually is. Under magnification, whizzed coins can be detected. Also called Wire Brushing. Wire Rim A rim or border of a coin formed into a thin wire-like protrusion, occurring when excess metal being pushed out between the edge of the die and the restraining collar. Wire rims are found on a few 19th century Proof coins, and other coins struck slowly, such as some of the MCMVII (1907) High Relief double eagles. Also called Wire Edge. World Coins Generally speaking, the coins issued by various nations of the world. Year Set A gathering of all denominations minted in a given year.